Fish captured at Selective Water Withdrawal Tower being prepared for truck transportation around the three dams at the Pelton-Round Butte Hydroelectric Complex. Photo by Greg McMillan. A Portland General Electric (PGE) spokesperson recently stated that the Deschutes River Alliance is opposed to the reintroduction of salmon and steelhead above the Pelton-Round Butte Dam Complex. Here is the quote: “They [the DRA] want to go back to status quo prior to the selective water withdrawal system, and essentially to abandon the reintroduction effort for salmon and steelhead above the dams.” The statement was made in the August 24, 2016 edition of The Source newspaper. We are not sure what the PGE spokesperson was basing that information on. We have never stated that we want to “abandon the reintroduction effort.” His statement was erroneous and misleading. The DRA has regularly asserted our support for fish reintroduction – on our blog, at public events, and in various publicly disseminated documents. 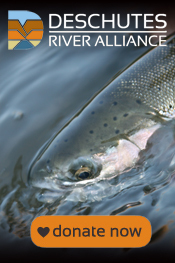 The Deschutes River Alliance does support fish reintroduction as long as it doesn’t take place in violation of the Clean Water Act, or degrade the ecology of the lower Deschutes River and tributaries above the Pelton-Round Butte Dam Complex. However, if the fish reintroduction goals are not attainable without serious negative consequences to other valuable resources, then the value of fish reintroduction needs to be reassessed. Unfortunately, what the PGE representative might have been trying to say is that PGE can only conduct fish reintroduction with the methods being currently employed. We believe that demonstrates a lack of willingness to adapt to conditions as they are. The concept of “adaptive management” is written into the dam license documents. To date all adaptive management efforts have been directed at reducing the water quality requirements for dam operation. Nothing has been changed; the goals have only been set lower. It is time to adopt alternatives that protect water quality while holding promise for even higher rates of fish reintroduction success. Fish capture facility at the Selective Water Withdrawal Tower. Photo by Greg McMillan. At the present time, fish reintroduction efforts based on surface water withdrawal at the Pelton-Round Butte Complex are consistently violating the Clean Water Act. That is the basis of our lawsuit against PGE, an action we do not take lightly or without extensive research, analysis and careful consideration. Further, selective water withdrawal and the resulting water quality violations have led to major changes in the ecology of the lower Deschutes River. These include changes in benthic algae, changes in aquatic insect hatches and populations, and changes in insectivore (insect eater) populations such as songbirds and bats. Warmer spring water temperatures due to surface water withdrawal are very likely responsible for a smallmouth bass invasion in the lower river. This year the Deschutes River at the mouth reached 60 degrees about 45 days before the Columbia River did, likely luring bass from the Columbia into the Deschutes. The ecological impacts of tower operations are not limited to the downstream ecosystem. A recent report (Genetic Determination of Stock of Origin for Oncorhynchus mykiss Collected in the Upper Deschutes River Basin, Adams, DeHaan, et al, March, 2015) states that native redband trout have been all but extirpated from Whychus Creek. The cause cited is the genetic introgression of hatchery steelhead (planted for reintroduction purposes), which, once planted in Whychus Creek, failed to out-migrate and spawned with native redband trout. This has perhaps changed the redband trout genetics in Whychus Creek forever. We strongly support the habitat rehabilitation work being done on Whychus Creek, McKay Creek, the upper watershed of the Warm Springs River, and the work being done in the upper reaches of Trout Creek. These are necessary efforts. These habitat improvement projects should take place irrespective of fish reintroduction for all the benefits this work provides. But the hatchery fish used for reintroduction purposes should not displace native resident fish. Fish reintroduction efforts began in 2008 when juvenile fish were first planted in the tributaries to Lake Billy Chinook. To date, the results of the reintroduction effort have been less than successful. Numerical goals defining successful fish reintroduction contained in the Federal Energy Regulatory Commission license for the project have never been met, and we can see no likelihood that they will be. PGE has claimed that they need more time. To do what? What is going to change in the next year or two that will result in enough juvenile fish migrating to the fish collection facility at Round Butte Dam (there to be trucked around the dams), or enough adults returning to the Reregulation Dam (to be trucked up to the reservoir), to meet the stated and defined goals of the reintroduction program? Last year 32 sockeye salmon returned to the Pelton-Round Butte Hydroelectric Complex. Later analysis showed that only 3 of those fish originated from the dam complex. PGE claims that this year 400 sockeye have returned to the project. But how many of those fish are from out of basin or not otherwise part of the reintroduction program? Steelhead and Chinook salmon returns have been less than bountiful. Juvenile arrival numbers at the fish collection facility at Round Butte Dam would predict no improvement in adult fish returns for at least the next few years. An objective audit of the fish reintroduction program needs to take place. We believe a major revamping of the reintroduction program is necessary if the program is to succeed and the serious unintended consequences of reintroduction are to be stopped. The DRA has always supported fish reintroduction. But the fundamental requirements of the Clean Water Act must be upheld, and the Deschutes River’s ecology and resident species must not be sacrificed. The reason that fish need to be reintroduced is because several major runs of anadromous fish were lost when the dams were constructed, blocking access to some of the most important spawning habitat in the Deschutes Basin. Let’s not compound that loss with a new generation of loss. On Friday, August 19, Montana’s Department of Fish, Wildlife and Parks announced the closure of 183 miles of the Yellowstone River to all recreational use. The reason for the closure was the discovery of over 2,000 dead mountain whitefish and reports of dead rainbow trout and cutthroat trout. The cause of the fish die-off appears to have been proliferative kidney disease (PKD), which is caused by a parasite known as Tetracapsuloides bryosalmonae. In the past, this organism has caused outbreaks of disease and fish death amongst salmonids in various hatcheries and freshwater in the Pacific Northwest. It seems to be most hazardous to fish when water temperatures reach and stay above 54 degrees F. The Yellowstone River has been low and warm this year. There are no antibiotics to treat the infection. The Yellowstone River was closed to prevent transmission of the infectious agent to other waters. We want to bring this to everyone’s attention as a reminder that if you travel to different bodies of water to fish, please be sure to clean wading boots, waders, fish nets and boats prior to moving to the next body of water. There has been a fair amount of controversy and disagreement as to what adequate cleaning consists of. We are providing a link to the most recent, and arguably most logical, guidance on the cleaning of fishing equipment. The instructions are relatively easy to follow and don’t include any measures that shorten the life of your gear (bleach, heat, etc.). Please help us keep the lower Deschutes River and all bodies of water free of invasive species! Selective Water Withdrawal Tower surface structure. Round Butte Dam is to the right of the tower. On Friday, August 12, 2016, the DRA filed a Clean Water Act citizen suit against Portland General Electric (PGE), to enforce water quality requirements for dam operations at the Pelton-Round Butte Hydroelectric Project. The requirements are found in a water quality certification issued by the Oregon Department of Environmental Quality as part of the federal licensing process for the Project. These requirements, for criteria such as temperature, dissolved oxygen, and pH, were designed to ensure the Pelton-Round Butte Project complies with applicable Oregon water quality standards. Ultimately, the requirements and the underlying standards are aimed at preventing degradation of water quality, and at preventing harm to the various beneficial uses of the lower Deschutes River. Unfortunately, since the Project’s selective water withdrawal tower began operations in late 2009, PGE has operated the Project in violation of these requirements. Through June 2016, the DRA has identified over 1,600 daily violations of the Project’s water quality certification. Fish being held at SWW Fish Collection Facility to await truck transportation around Pelton-Round Butte Dams. The fundamental mandates of the Clean Water Act must be upheld. Many of us remember the days prior to the CWA. Rivers were so polluted in the United States that some caught fire. Fifty years ago, for example, the Willamette River was little better than a sewage ditch, and now vast reaches of it are restored. The lower Deschutes River must similarly be afforded every fundamental federal and state legal protection necessary to preserve and restore its beneficial uses and ecological integrity. To date, the Oregon Department of Environmental Quality has not enforced the Project’s key water quality limitations, so the DRA is taking action directly under the Clean Water Act’s citizen suit provisions. The lawsuit has been filed in Federal District Court, District of Oregon, Portland Division, and we’ve placed a copy of the filing on our website. Round Butte Dam to the right, SWW Tower in center. View is looking west at Metolius Arm of Lake Billy Chinook. Litigation is clearly an option of last resort. We remain open to discussion with PGE, of course, but this lawsuit, at this time, is a necessary step toward restoring the river we all love.